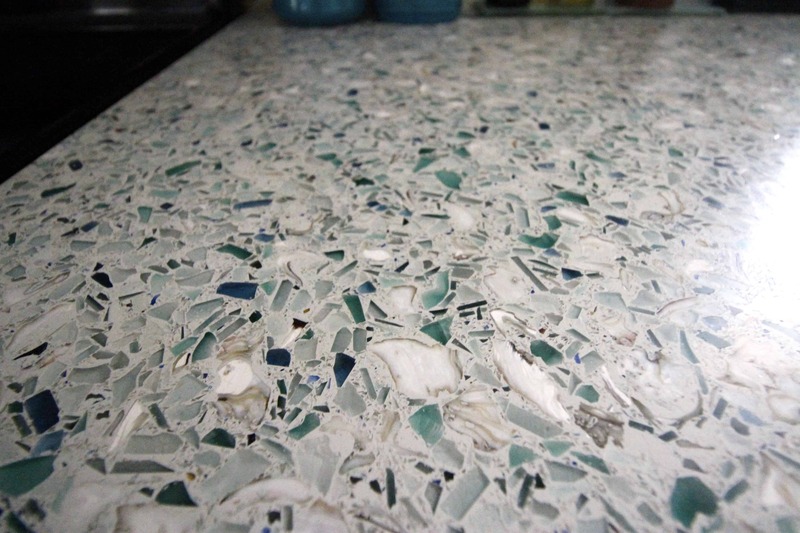 All of the Details of our Recycled Glass Counter Tops! 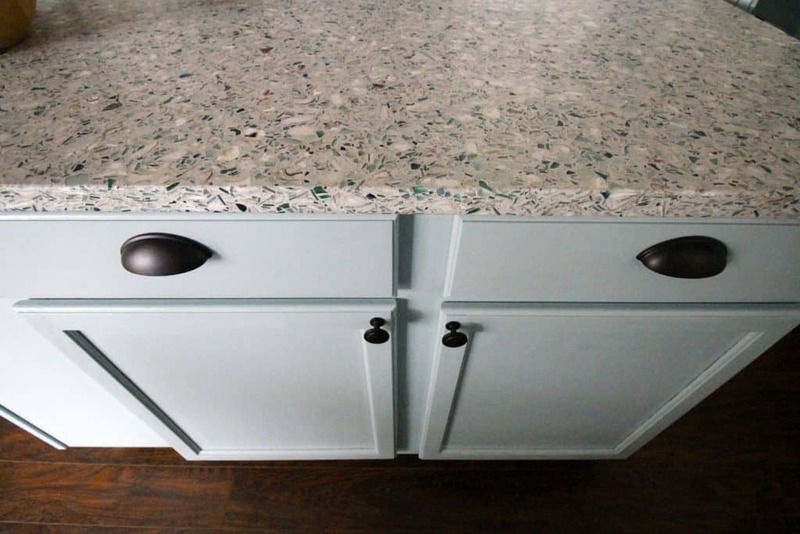 You are here: Home / Home / Home Improvements / All of the Details of our Recycled Glass Counter Tops! 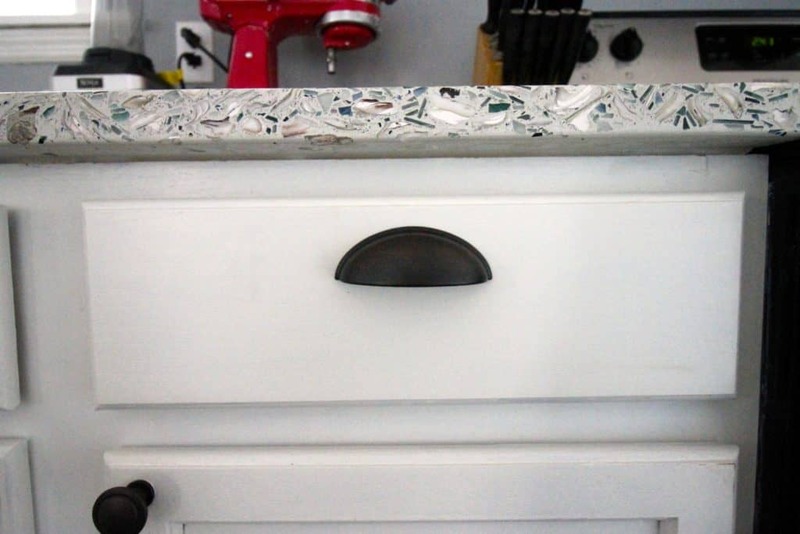 If you’re stopping over for the first time from Facebook and love our recycled glass and oyster shell counter tops, Check out all of the details on our DIY colorful coastal kitchen here! 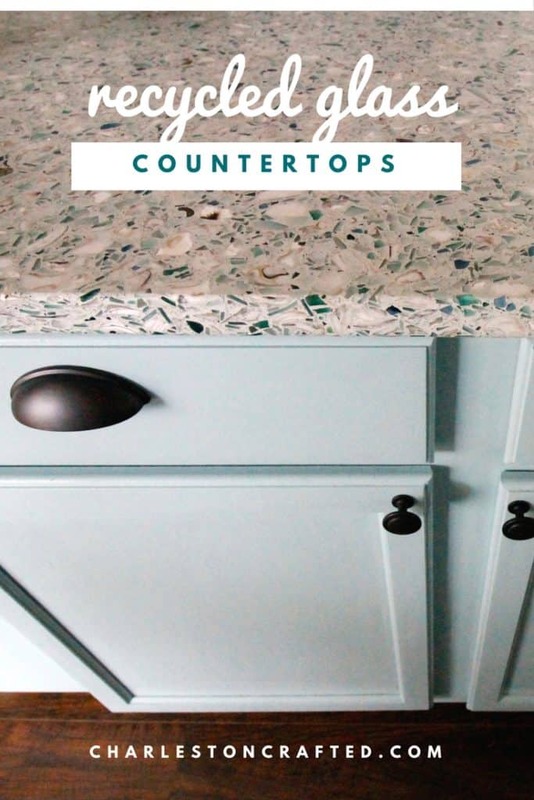 Love these counter tops? Pin them for later! 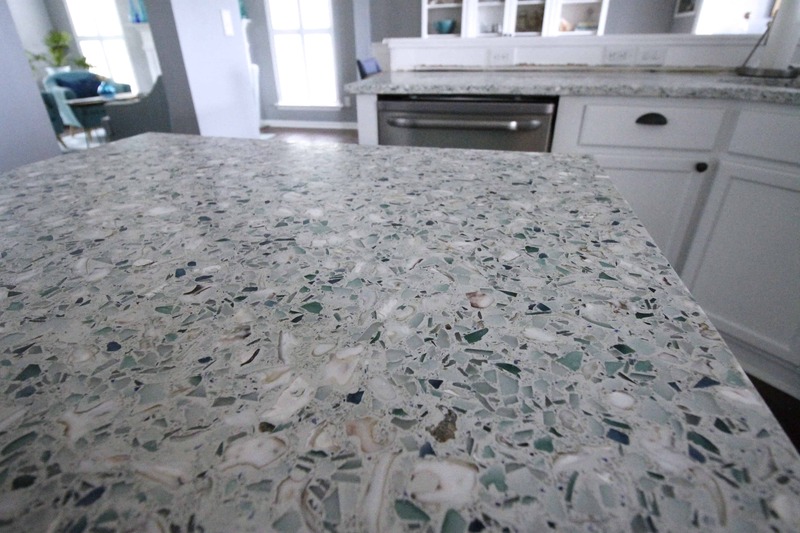 Why did we choose Recycled Glass Countertops? I love the unique look of these counter tops. I originally saw the all oyster version and thought that they were lovely and beachy. When I first spotted them with blue and green sea glass, I knew that it was exactly the beachy look that I wanted in our kitchen. I did some research and determined that they were durable and sustainable and knew that they would be a great decision. Where did we get them? We got our counter tops from Fisher Recycling. I found them via Instagram actually. We used them because they were local (in North Charleston, only 10 minutes from my work and about 30 minutes from our house). 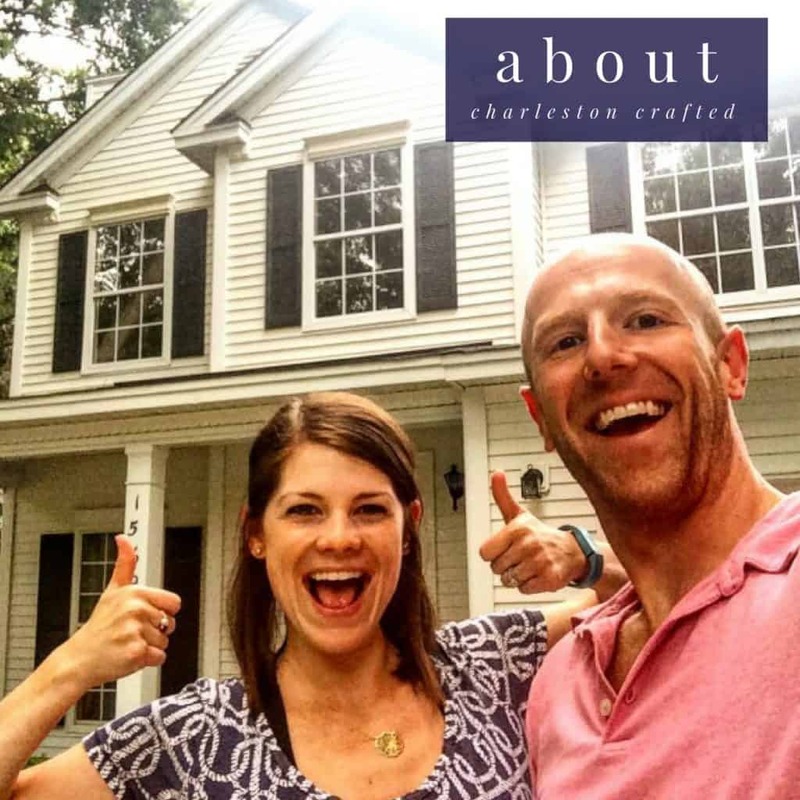 We worked directly with the owners and had an excellent experience. I would recommend them 100 times over. First, we had an appointment at Fisher Recycling with Elizabeth, the owner. She told us to bring inspiration so I brought tile and paint swatches for the room. We got to play with all of the small pieces of glass that they had (the light green is wine bottles, dark green is coca cola glasses, and the blue is from an old window!) and make the exact formula. She then emailed me an exact quote for that mix and we went back and forth to get it to the price point that we wanted it at. Next, we had to secure an installer. 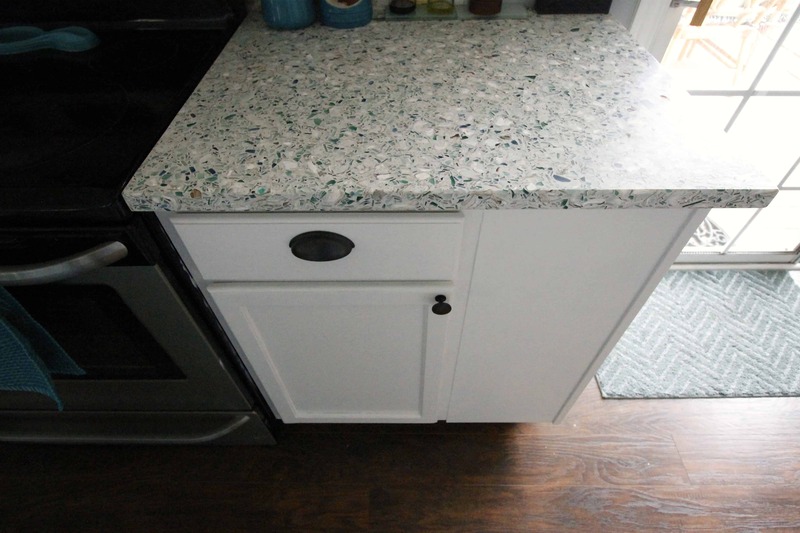 Fisher Recycling pours the counter tops but does not install them. We called and got quotes from several local places (Elizabeth gave us a long list) and we ended up going with Eugene’s Marble and Granite because of their price and their professionalism (they came on time! Shocking how rare that is.) This took about 3 weeks but only because we got so many quotes. Once we were set on an installer, Elizabeth made us a sample of the counter tops with our formula. I picked it up and had the chance to make any edits that we wanted. At this point we made a 50% down payment and OKed them to move forward creating our slabs. It took about a week for Fisher Recycling to pour our slabs. When they were done, I went by their facility and approved the slabs. They were gorgeous! They passed them off to the installer and 5 days later they were installed. The counter tops ran us about $70 a square foot. This did not include installation which was another $30 a foot. So, they were more expensive than granite or quartz from a big box store, but to me the price difference was worth the look and uniqueness. I am so very obsessed with them. I love love how they look, I love the expanded area due to our open shelving and tilt out trashcan. I love the colors with the green island. And I can’t wait to get the backsplash up to complete the look! As a reminder, we removed the old counter tops ourselves to save $150. It was really easy to do and you can re-visit the entire process here. 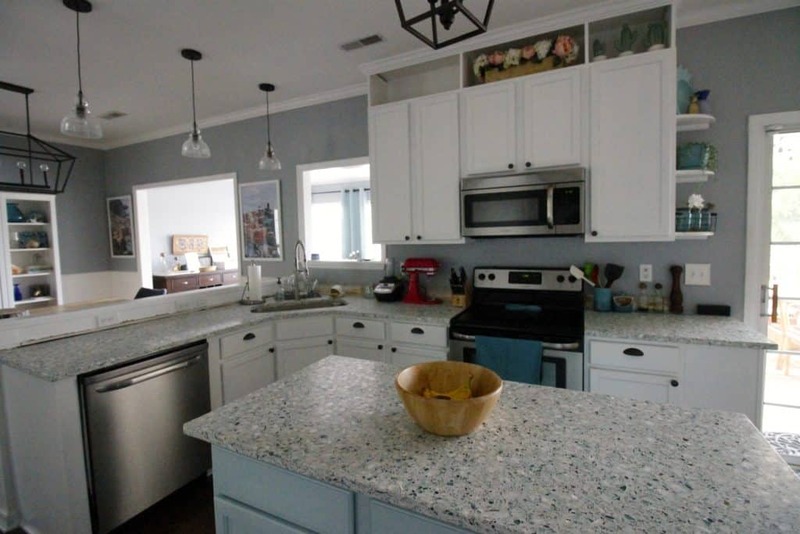 Again, if you’re finding this post for the first time through Facebook, we hope that you’ll click over and learn more about us and check out the rest of our coastal kitchen! Wow, these are so unique. Very pretty!! So pretty! I’ve actually never seen something like this. It’s super unique.